Obed edged out two other opponents to win a second term leading Inuit Tapiriit Kanatami, Canada's national Inuit organization. 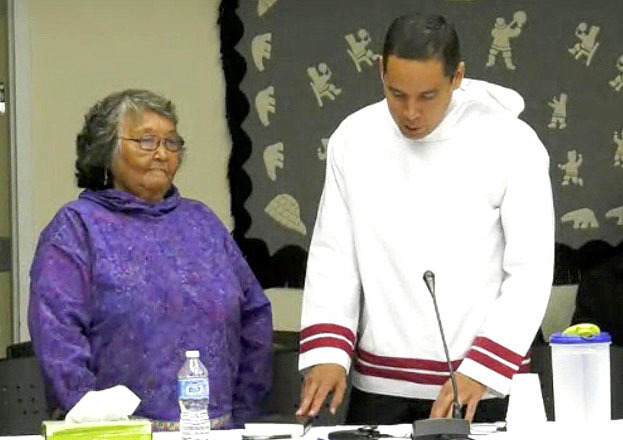 Inuit Tapiriit Kanatami delegates elected Natan Obed to a second term as president at the organization’s annual general meeting in Inuvik, Northwest Territories, on Thursday, Aug. 16. The election was a three-way race that pitted Obed against two other Nunavut hopefuls. Peter Williamson, a political newcomer, campaigned on his depth of experience in Arctic policy and economic development with the federal and territorial governments. Peter Ittinuar, Canada’s first Inuk Member of Parliament, pledged a more effective strategy to combat suicide and tuberculosis in the North. Obed was elected by a group of 13 voting delegates representing each of the four Inuit regions. He garnered a majority of those votes, ITK said, though the organization did not offer a breakdown. His re-election drew congratulations from other Inuit and government leaders, including Nunavut Premier Joe Savikataaq. “His work over the last three years has put the culture, challenges and priorities of Inuit on the national and international stages,” Savikataaq said in an Aug. 16 release. Obed credited his re-election to the relationships he’s made over his last term and a track record for moving ITK’s various projects forward. “Today was less about introducing myself to the board, but [saying] what I believe is possible in the next three years,” he said. “I don’t think it’s going to be put to rest until I’m entirely fluent and able to communicate with all Inuit,” Obed said after his election. Obed said he understands the symbolic and practical reasons to expect a leader would speak Inuktitut. But Obed said it has also allowed for negative debate around identity and the ability of non-Inuktut-speaking Inuit to hold office at ITK. “We need to do more. For my part, I pledge to continue to learn Inuktut and continue to promote the language,” he said. ITK’s president is elected by its group of delegates appointed by each of the Inuit Nunangat’s four regional Inuit organizations. Nunavut was represented by Nunavut Tunngavik Inc.‘s president Aluki Kotierk, the Qikiqtani Inuit Association’s president PJ Akeeagok and the Kivalliq Inuit Association’s president David Ningeongan. In Nunavik, Makivik Corp.‘s vice president Andy Pirti represented that organization along with two delegates, Mary Arngak and Darlene Partridge. The Inuvialuit Regional Corp. and Nunatsiavut Government each brought three voting delegates, while Monica Ell-Kanayuk, the new president of Inuit Circumpolar Council-Canada, also had a vote in the Aug. 16 election. ITK’s election wrapped up a week of board meetings and the organization’s annual general meeting, which included ITK’s efforts towards new Inuit-specific policy and legislation. The organization’s board of directors also finalized ITK’s National Inuit Climate Change Strategy, the details of which will be released in the coming months.